Seeing is Believing This sample manual to teach Career Development is in MS Word format. Investing financial resources in training materials that focus on developing the skills of individual employees is a pro-active measure to increase the prosperity of an organization. Well-educated employees who are eager to advance their own career goals become an organizational resource in their own right. Individuals who have been prepared to deal with change, and adjust to a dynamic business environment are essential in the growth of an organization. 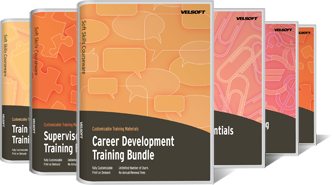 Our training materials included in the Career Development Bundle have been professionally designed to provide instructors with the resources to instill confidence in their learners. The titles included in the Career Development Bundle review the essential skills for writing, thinking, speaking- and ultimately communicating. You will be giving your students the knowledge they need to improve their work performance, their relationships with customers, as well as their own self-image. As an instructor, you will understand the effectiveness of our training materials when the results are confident, competent, critical thinking employees.